I Am the Master of My Destiny: We're Engaged!!! I’ve been wearing this ring for 53 days already and honestly, I often find myself staring at it. It’s so pretty and CHINO IS MARRYING ME!!! I’m not really into jewelries because I often misplace it so most of time I’m paranoid about this ring =)). Last year, Chino gave me a bracelet and I somehow managed to lose it after working out at the office gym. I was so sad and guilty that I ended up buying a new Pandora when we went to Vietnam, thank God it was on sale!! The ring fits perfectly but I can’t afford to replace it =))). My friend told me that there’s this thing called “ring snuggies” from True Value which makes it tighter! So yeah, I’m just over the moon that Chino and I are taking a leap of faith together! I still remember the day when he proposed, it was a Sunday and 7 days before Christmas. We’re hungover from a Christmas party hosted by my cousin and we went home at around 3AM. After 7 hours, we woke up because we had some errands to do. As usual, I’m the one who got up first to prepare because ladies have to do lady preps =)). I ended up wearing jeans with my Ginebra back to back champion shirt. My dad gave it to me months ago and I wanted to show him that I’m using it. Rarely does Chino comment on what I wear and that time, he asked if I’m really wearing my fangirl shirt. I didn’t give a fuss because I remembered our plans for the day. Go to SM North to get my ATM replacement, visit my parents & eat lunch with them, attend mass in QC and finally Chino will treat me to a steakhouse in the same area. I thought that maybe we’re going to a fancy restaurant that’s why he’s hesitant about my Ginebra shirt so I just changed into another T-shirt. We finished our bank errands in a breeze but it took us 1hr to book our Uber ride to my parent’s house. We even ended up eating one of the pork bun pasalubongs. When we arrived at our house, only my mom was there, we ate our late lunch together and had our usual catch up. I had to go upstairs several times and leave Chino when my mommy asked me to get my new bag aka a gift to her but she already has it it the same color. When we arrived at St Paul Parish in QC, the priest already started the homily. We stood outside for 5 minutes until we found vacant plastic chairs on the right side near the door. I remembered that we really enjoyed listening to the priest’s homily, he’s a funny one. After mass, we usually go to the priest and wait our turn to be blessed with holy water. Chino told me that we should sit first and wait until people got off the Church before we book our Uber ride. I agreed because during that time, aside from his backpack, we’re carrying a big Gold paper bag which contained my new bag. We waited for our turn to talk to Father Arlo because Chino said he wants to ask him to bless something. This is the part where everything gets blurry =))). I remember standing next to Chino and eagerly waiting for father to face us. Then Chino asked father if he can bless something important and he got a box from his pocket. Father Arlo then called everyone who’s still inside the church to gather and witness a special moment. I think, that’s when I started crying. I saw Chino kneeling before me with a ring in his hand. He asked me if I will marry him, I said yes in between sobs. Father Arlo gathered us in a group hug and I saw people around us were taking photos, clapping, smiling while we’re in a daze. Father commented that it was his first time to bless an engagement ring and a couple. Chino mentioned that maybe he should officiate our wedding. Father Arlo also gave his sweet YES =))). We thanked father Arlo once again and while exiting the church, we bumped into a happy, middle aged couple who congratulated us and said that that’s the best way to kick off our married life. They wished us well and we thanked them. Finally, when we’re at the restaurant, I still can’t believe what happened but the spark from my ring reminds me that I’m engaged!! We started messaging our family while waiting for the food. My parents weren’t surprised because it turned out that Chino asked for my mommy’s permission when I went upstairs. 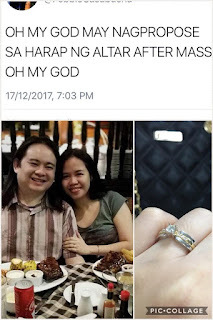 He already had this ring for several months, he even asked for his parent's blessings last April but he couldn't find the right timing to talk to my parents. Since my daddy wasn’t around, mommy said that she’ll inform him instead and Chino can proceed with his plan. When I showed a photo of my ring, my daddy said that he’ll buy my mommy a better ring. =))) My siblings scoffed that I should start dieting! For a second, we regretted that nobody captured our engagement but we realized that it didn’t matter. We’ll always have that special memory..with Father Arlo and this tweet haha!